Welcome to my blog, where I talk about my life and experiences in art and "Irishness." I invite you to share in the conversation - I hope you enjoy your visit. Has Irish Dancing Lost it's Way? What a week for Irish dancing in the news! I am referring, of course, to the recent controversy surrounding an incendiary article published on IrishCentral.com, "Why Irish Dancing Has Lost its Way and Needs to Change." This firestorm appears to have, in part, been touched off by recent changes in costume control issued by An Coimisiún. It would seem that the article's author, Cahir O'Doherty, seized upon an opportunity to wade into some pretty muddy waters and nearly drowned himself in a deluge of angry criticism. I've been researching Irish dance costumes for over five years now and been dancing, off and on, since 1987. I've talked a lot about the major changes in costumes which have occurred in the last twenty years. As a phenomena, it is truly, TRULY remarkable. In fact, I know of no other cultural dancing costume which has changed quite so significantly. Like many "old school dancers" I was sad to see the more traditional styles replaced, but as a scholar, I was forced to put my own sentimentality aside and examine the phenomena with a neutral eye. I saw Cahir's column for what it was: a cheap shot at a subculture that no longer conformed to his own ideals. This is unprofessional and inappropriate "journalism" and anyone directing such inflammatory language towards a sport populated by children and adolescents is not someone worth having an argument with, to my mind. But buried beneath all of Cahir's snarky quips, some painful truths about the art/sport ("spart?") were revealed that we in the community should really pay attention to. For example, a comment on Molly Egloff's rebuttal piece pointed to an alleged impropriety in the world of competitive Irish dance: an adjudicator, by the name of Gavin Doherty, who is also the leading costume designer in Northern Ireland. If this is true, (and I make no claims that it is) would this not allege a conflict of interest worthy of our examination? The other major theme that resurfaced consistently is that old criticism of "this isn't Irish!" Seriously ya'll, this needs to just go away. Like DIE. What most people know for real and for certain about Ireland, it's art and it's culture is minimal and often erroneous. I'm say this not to be offensive! (Though I know many of you will be.) But you should understand that the things YOU associate with Ireland are a part of a manufactured identity. This "Celting up" of Ireland was popularized firstly in Ireland at the turn of the twentieth-century to help create a new identity for the Irish, wholly separate from their Colonizers, Great Britain. This period was called, "the Celtic Revival." 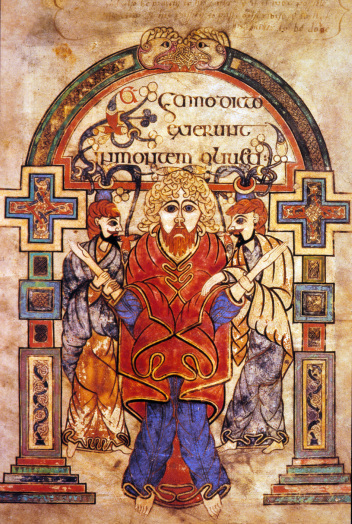 This "Celtic" identity was then sold second-hand back to us, the Diaspora suckers, who ate it up like McCann's steel cut oatmeal. 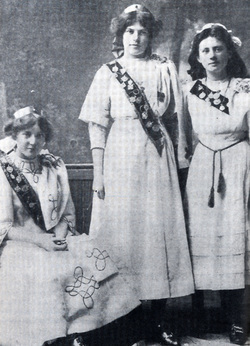 The fact that anyone is wearing a costume at all, PERIOD, is a twentieth-cetury invention and in fact, the embroidered interlace (call it "the Irish" in an Irish dance costume) didn't really appear until around the 1920's or later in many parts. The contemporary costume is yet another chapter in the life of a living tradition. It's about a very different thing than what we, or our grandmothers, wore as children. We need to accept that fact, let it live forever in our memories, and move on. HOWEVER - dancers, this does not let you off the hook! What does all of this stuff mean? If it doesn't matter in the scoring, than why is it necessary? "Because we want to" should not be an acceptable answer. Ditto with the old "confidence" argument. (If you need expensive clothing for confidence, than it's time to re-examine your priorities - just sayin') Think about this question, honestly and completely: What does all of this stuff mean? Is it really necessary? Irish Dance is many things: art, sport, expression of heritage - but it is also Big Business. 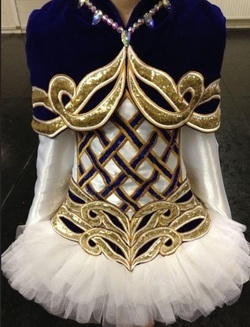 If anyone is wondering why the "Riverdance" look never caught on completely, just ask a dressmaker. Do you think a bit of simple, unadorned stretch velvet could go for $2500? HECK NO! Your costume is sending a message. Do you REALLY want that message to be, "$$$?" "...when they had a feis on they would assemble at North Monastery, north of here and they would parade in their costumes and the pipers in their kilts and the tri-color and they would parade through the city to wherever the feis was... And that was an extreme expression of Irish national identity because this was during the British occupation. This was the time, they marched down Patrick Street [Cork], and that main street was burned to the ground by the Black and Tans...and yet they were marching in full costume with tri-colors." photo credit: Irish Dancing Costumes: Their Origins and Evolutions, Dr. John Cullinane. 1996. CLRG bans makeup, false eyelashes and carriage aids! In a bold move, An Coimisiún le Rincí Gaelacha is banning makeup and false eyelashes for children under age 10. In an attempt to address recent criticisms of the excessive (and might I add wildly inappropriate) amount of emphasis placed on a young dancer's physical appearance, the CLRG has ruled all makeup a no-no, though wigs are still allowed. This is long overdue. Good on you CLRG! Want to learn more about the History of Irish Art? Folio 114r, Book of Kells - the so-called "arrest scene"
To that end, I'd like to announce that I am now booking for the spring and summer lecture season! (Hey, an Irish Art Historian has to HUSTLE , right?) 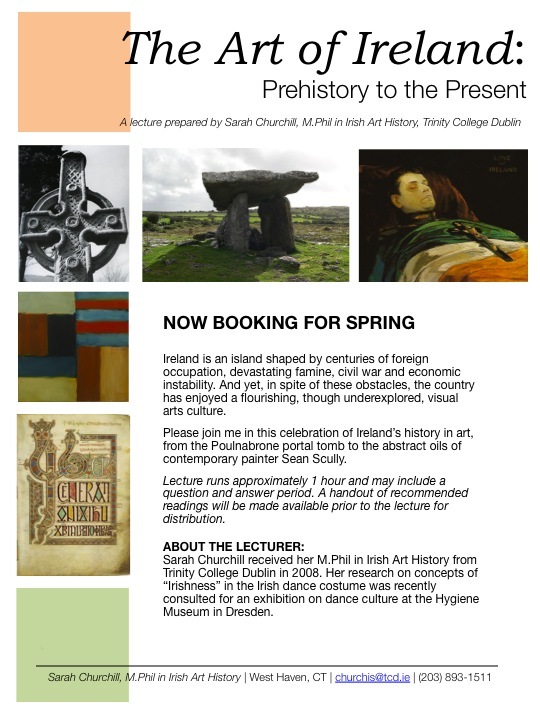 I'm offering an exciting survey lecture aptly entitled, "The Art of Ireland: Prehistory to the Present." Please join me in this celebration of Ireland’s history in art, from the Poulnabrone portal tomb to the abstract oils of contemporary painter Sean Scully! Lecture runs approximately 1 hour and includes a question and answer period. A handout of recommended readings will be made available prior to the lecture for distribution. To book, please email me at churchis@tcd.ie. You can also download a flyer HERE. HEY! Has anyone seen me lucky charms? "All in favor of cultural sensitivity in children's television, say I!" My daughter is two. We watch far more (educational) children's television than I care to admit. I've learned to appreciate the finer points of Sesame Street but when Mickey Mouse Clubhouse comes on, I'm reaching for my phone or a magazine or the phone book - anything to keep the boredom at bay. But yesterday while busily folding laundry I looked up to discover the Mouse and his buds chasing a rainbow in search of that most appallingly dreadful of Irish stereotypes... the leprechaun. Just last week Imagination Movers (I told you we watch too much television) rolled out a guest character, the Irish golfing sensation, "Ace Mulligan!" What proceeded was approximately 22 minutes of the worst Irish accent I've heard since Gangs of New York. And the episode's special song, "Luck of the Irish" featured a wagon full of potatoes, plenty of plaid and some pretty sorry "Irish dancing" (to say nothing of the lousy musicianship.) Apparently there are no historians on the bankroll at Disney Jr.
OK! OK! I'll get off the soap box now. I'm just saying, the whole business smacks of Punch circa 1880. No culture deserves to be deduced to a mascot or an offensive punch line. (AHEM Washington Red Skins.) Irish art and culture deserve better, so let's demand it. Now raise your glass of green beer and pour it directly down the drain, where it belongs. 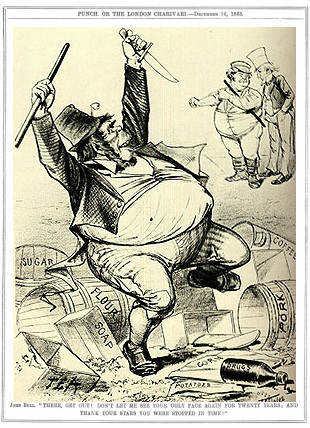 Unflattering depictions of simian Irish abound in 19th century illustrations, such as this example from Punch, 1863.